By the fifties, Radio Flyer had secured its name in households across America, rubbing elbows with auto giants such as Ford, Chrysler, and GM. World War II and the Great Depression were now over, affordable homes began to sprout up everywhere, and the baby boom was in full swing  a shift had begun for the country, and for Radio Flyer. 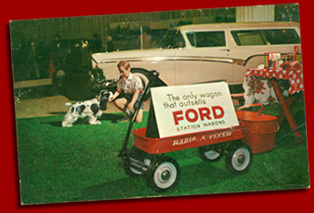 During this time, Radio Flyer began to design specialty wagons inspired by popular movies and TV shows of the time, such as the Mickey Mouse Club and Davy Crockett. With these exciting new wagon designs, came exciting new catalogues, brochures, and packaging. Business was booming. In 1957, Radio Flyer introduced a line of garden carts to help out with lawn care in the nation's fast-growing suburbs. This revolutionary design made it easier to carry a larger load in a smaller area  its heavy steel construction and baked enamel finish also added to its durability.